so sorry for being so lame on the posts. This school year has gotten crazzzzzy busy...which I am not liking. We've gotten some snow and I was fortunate to have two snow days last week and 2 hours late today! Snow and ice are teachers favorite friends in the winter time! But I am looking towards spring and looking at spring shows to do. 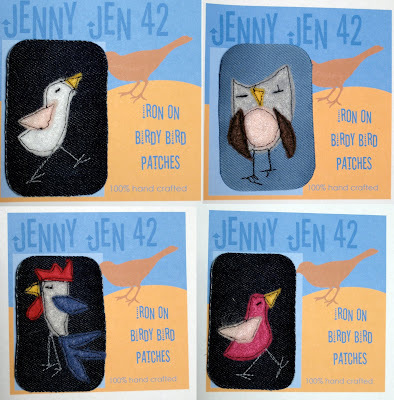 Looking at spreading my birdy bird wings to Richmond Va and Philadelphia this spring ! I really enjoyed getting out of charm city last year. So this year's goal is to go even farther. Thanks to Property taxes my funds have been on the way low, so I've been making what I can with what I got. 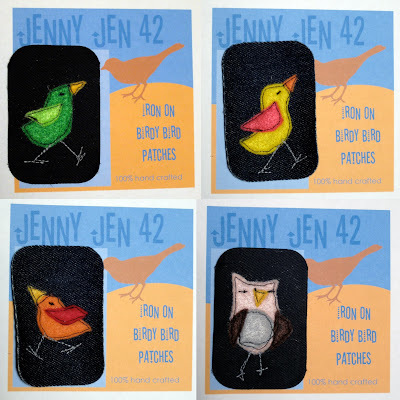 Here's more patches...they can be purchased for a wee $4 each on my shop...makes a sweet Valentine present for the little ones or your special sweetie!